Commentary: Will voters put Utah kids first? 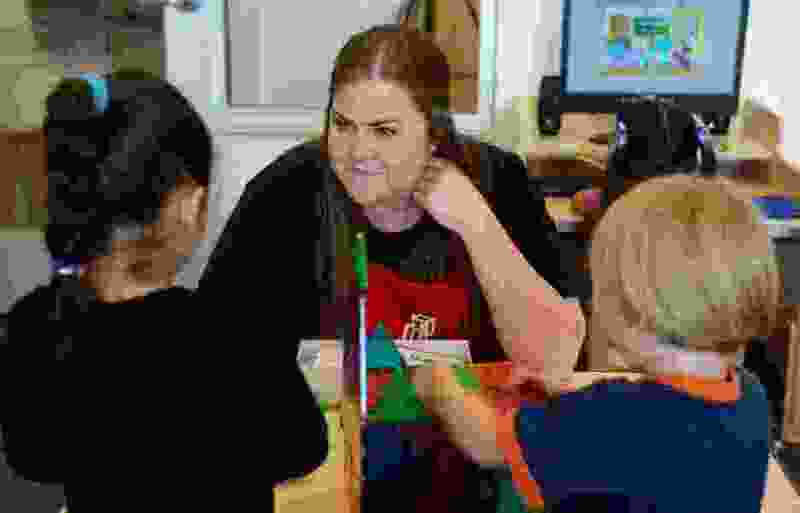 (Steve Griffin | The Salt Lake Tribune) Lindsey Meyer works with her students as Lt. Governor Spencer Cox visits a Head Start classroom as he and the Intergenerational Welfare Reform Commission officially release UtahÕs Fifth Annual Report on intergenerational poverty, welfare dependency and the use of public assistance during a press conference Thursday September 29, 2016. Utah is taking a unique approach to addressing intergenerational poverty by distinguishing from situational poverty and by using a two-generation approach to families by serving parents and children simultaneously in four focus areas: early childhood development, education, health and family economic stability. Hundreds of Utah teachers are choosing new careers outside of education this school year. Those still working with Utah students can’t help but ask: Will this be the year Utahns put our kids first? Never before has the need for strengthening public education in Utah been clearer. As Utah Teachers of the Year, we know the opportunity to improve academic outcomes for Utah kids can be reached by voting for Question 1. Kids in Utah are not reaching our collective expectations despite the best efforts of dedicated teachers. Fewer than 50 percent of Utah students are proficient in math, science or English, according to end-of-level testing. National evaluations underscore the need to improve Utah’s K-12 education system. For example, CNBC awarded Utah a D+ in education, Education Week a C-, WalletHub ranks Utah 30th in the United States for education and U.S. News & World Report places Utah K-12 20th. Whichever way you look at it, Utah kids deserve better. With approximately 650,000 Utah students in K-12 schools, what is keeping more than half of them from competing with the best and the brightest? First, Utah’s student to teacher ratio is the third to worst in the country, at 23 students per teacher. Class sizes for traditional core subjects in secondary schools often exceed 40 students, while it’s not uncommon for elementary classes to reach 30. With so many students assigned to one teacher, many students miss out on the personalized instruction needed to make significant progress each year. Second, Utah’s teacher shortage leaves classrooms without traditionally qualified educators. Nearly half of Utah teachers quit within their first five years, according to the Utah Education Policy Center, leaving school districts forced to hire non-traditional educators. As teacher preparation and experience have dramatic results on student achievement, Utah must better recruit and retain well prepared, qualified teachers in every classroom for kids to succeed. Lastly, funding. It’s widely known that Utah spends less per student than any other state in the nation. A less known fact is Utah’s real per-student funding, which accounts for inflation, has remained flat for the past twenty years. It increased some years; other years, such as during the Great Recession, it dramatically decreased. In total, we have not increased our investment in Utah kids for two decades. Question 1 increases investment directly in local schools, bringing funding into the classroom to improve teacher success and student achievement. Individual schools would create a plan detailing how their allocation will be invested to meet the needs of their students, while the school board verifies the funds are used only for academic purposes. This innovative approach allows each community to participate in how the funding is spent, measure what results are achieved, and ensure that funding isn’t used toward district administration or school construction. Question 1 is a high-yield investment. Through a 10-cent increase in the gas tax, the average Utah driver would invest just $4 per month while boosting investment into Utah classrooms by over $100 million each year. Utah kids would receive high-quality teachers, greater individualized learning opportunities through class size adjustments and classroom aides, and improved in-class resources to increase student achievement. Question 1 puts us one step closer to outstanding education in Utah. No two children learn the same, and additional investments will provide local teachers incredible opportunities to reach and teach every Utah student. Our kids will receive greater opportunities to prepare themselves for lifelong success and compete with students across the nation. As another school year begins, we encourage voters to put Utah kids first by voting for Question 1. Aaryn Birchell (Uintah School District), Valerie Gates (Salt Lake), Allison Riddle (Davis) and Gay Beck (Alpine) are longtime Utah educators, having each been recognized as Utah Teacher of the Year. To learn more about Question 1, please visit ourkids1st.com .